There are various reasons why a homeowner chooses to replace the windows in their home. Older windows may be warped, cracked, painted shut, or have issues with condensation or leakage. They may be outdated looking and not fit the style of a new renovation. And old windows don’t have the energy efficiency and ease of operation features that today’s replacement windows do. When researching replacement window options, two choices are very popular: vinyl windows and fiberglass windows. Both types offer strength, insulation, and energy efficiency properties. But there are features with each type of material that you should familiarize yourself with so you can make an informed choice for your window replacement project. Fiberglass window frames are made up of glass fibers in a resin mix. This creates a very strong window that stands up well to heat and weather, making them energy efficient. Fiberglass won’t warp or rot like wood windows. The frames can be designed to look like wood grain, giving the look and feel of a wood window without the extensive maintenance required. But fiberglass also has some drawbacks. Because they are fastened together at all corners and joints, they can weaken over time and leak. Fiberglass windows are only available in a limited number of sizes and features. And while fiberglass windows are comparable to vinyl as far as durability, their cost is typically much higher due to the more difficult manufacturing process. Vinyl replacement windows are manufactured using polyvinyl chloride. The manufacturing process creates a series of internal chambers within the window frame, insulating the windows and making them extremely energy efficient. The window frame color is mixed in with the polyvinyl chloride during the manufacturing. This means the color runs throughout the entire window frame so the color won’t peel or chip. Vinyl is a very durable material and won’t crack or warp over time like wood. Vinyl requires virtually no maintenance aside from the occasional hosing off. They’ll never need to be painted like fiberglass windows. Because they’re easier to manufacture than fiberglass, custom vinyl windows are available in an almost unlimited number of sizes and styles. And due to the easier manufacturing process, they tend to cost significantly less than fiberglass windows. 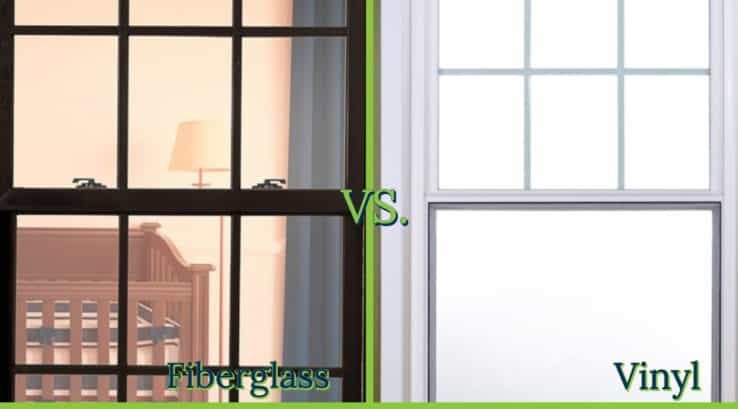 If you’re replacing your windows and are considering vinyl and fiberglass, consider the pros and cons of each. Vinyl windows give you strength, durability, energy efficiency, and low-maintenance compared to fiberglass, and at a lower cost.